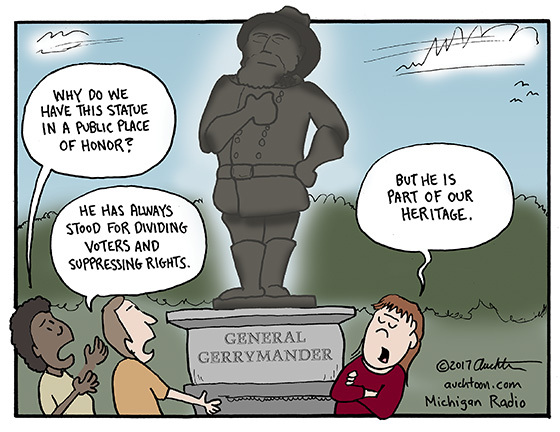 Why Are We Honoring General Gerrymander? I struggled with how exactly to draw a gerrymander statue. My initial instinct was to draw it as an abstract monster because that’s where the term came from. In 1812 a Governor Gerry in Massachusetts signed a bill to redistrict his state to benefit his political party. One of the oddly shaped districts resembled a salamander. A famous editorial cartoon exaggerated the district shape as a monster, and thus Gerry plus salamander became gerrymander. This also allowed me to more directly address the ongoing issue of venerating those who fought on the wrong side of the American Civil War. My thoughts: Cemeteries are good places to memorialize the dead. Museums are great places to remember leaders of the past. And books are fantastic places to document and add context to both. But let’s reserve public places of honor (town squares, monument rows, etc.) for the honorable. Tradition and heritage are good — until they start to choke us. We live in a dynamic country, and we are blessed to have a system designed to accommodate change. Let’s take advantage of that. I am on vacation this week. (I drew this cartoon last week, Friday.) I tried to anticipate how I would feel at this point. It was easy to predict (and poke fun at) my selfish self — that despite whatever terrible events were going on around the world, nation, and state, the thing I’d likely find most frightening was the end of summer. But it is also a testament to the beauty and wonder of our Michigan summer. I am among the blessed who can share a week with their Michigan family on a Michigan lake by working Michigan jobs at Michigan companies and schools, eating Michigan produce and possibly imbibing a few Michigan beers. That was my intention. And then the events in Charlottesville, followed by the “many sides” defense of our elected leader, his painfully scripted and insincere attempt at clarity, and then the inevitable doubling-down again on his “many sides” disgrace. Vacation time remains precious, so let me be direct and clear. If I were to draw the cartoon right now, it would be to deliver a singular message: Resign, Mr. President. Resign. Fortunately for other people, I don’t go to cocktail parties. 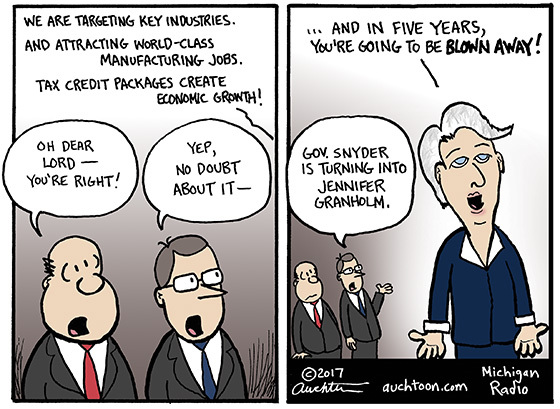 One pattern is that governors from Blanchard to Engler to Granholm and now Snyder end up trying to land the big fish. Despite whatever good intentions they might have had at first for growing the economy (investment in education and infrastructure for Democrats, reducing barriers and fostering small-business growth for Republicans), they all fall for the seduction of the mega-deals that promise thousands and thousands of jobs. I’m guessing it feels like an opportunity for a legacy. Often, however, the legacy is not a good legacy — especially for the mega-deals because they take a lot of tax money (credits, abatements, packages) to make them happen. It’s really difficult to tell whether they are worthwhile. In Wisconsin, Governor Scott Walker is trying to pull off a deal with Foxconn to build an LCD screen factory by offering $3 billion in incentives. The payback (assuming all goes well) would be in (wait for it) 25 years! 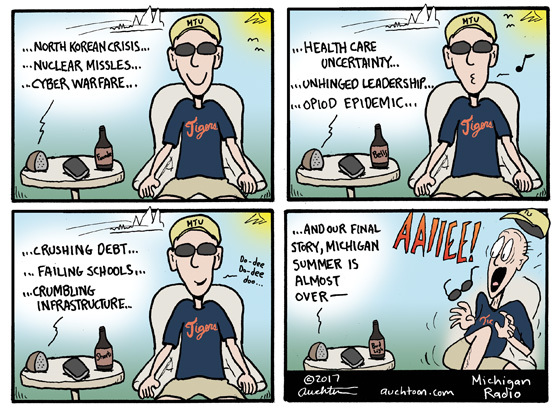 Okay, maybe the deals Governor Snyder wants to cut will turn out fine. But the language he’s using is very similar to the language Governor Granholm was using a decade ago. And didn’t Snyder originally run on a platform to get state government out of “picking winners and losers”? I guess it’s hard to remember that stuff when you’re concentrating on landing that big fish. 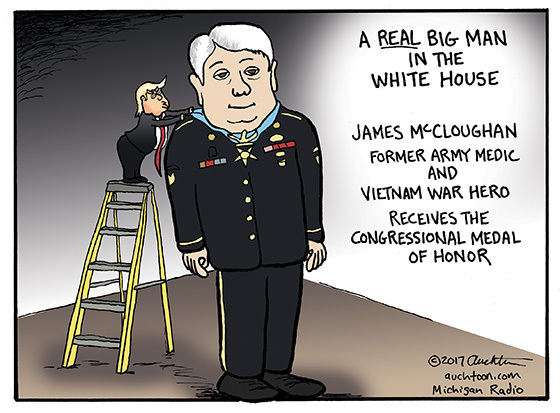 On Monday, July 31 former Army medic and Vietnam War vet, Jim McCloughan, was awarded the Congressional Medal of Honor by the President at a White House ceremony. A more detailed (and better told) account of this can be found on NPR.org. Editorial cartoonists often get accused of “politicizing” things that some people feel should not be politicized. I can see how some may feel this way about today’s cartoon. But for me, it’s not at all about politics; it’s about character and the stark, stark difference between the two men at the ceremony. Mr. McCloughan is the quintessential American hero. After Vietnam, Mr. McCloughan returned to Michigan and spent 40 years teaching geography, sociology, and psychology at South Haven High School. In addition, he coached football, wrestling, and baseball. Humble. Brave. Selfless. A thoroughly decent human being.